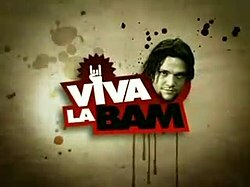 Viva La Bam is an American reality television series that starred Bam Margera and his friends and family. The show was a spin-off from MTV's Jackass, in which Margera and most of the main cast had appeared. Each episode had a specific theme, mission, or challenge which was normally accomplished by performing pranks, skateboarding, and enlisting the help of friends, relations and experts. Although partly improvised, the show was supported by a greater degree of planning and organization. The cast included Ryan Dunn, Brandon DiCamillo, Raab Himself, Brandon Novak, Tim Glomb, and Rake Yohn. The show also starred Margera's parents Phil and April and his uncle Don Vito. The show was mostly filmed in and around West Chester, Pennsylvania and also visited Las Vegas, Atlantic City, New Orleans, Los Angeles, Minneapolis, Mexico, Brazil, and Europe. Bam and his friends also went to Miami in 2006 for "Viva La Spring Break". The show debuted on October 26, 2003, on the MTV network in the United States and was later licensed around the world. The first episode featured Bam building a skatepark inside his house. Tony Hawk starred in this episode. Each of the five seasons consisted of eight half-hour episodes, with the fifth and final season finishing on August 14, 2005. Later that year, in December, Bam Margera addressed rumors of a sixth season on Last Call with Carson Daly. His comment was that there would be no sixth season, but there would be occasional MTV specials and he and Johnny Knoxville were planning things for possible Jackass stunts. The show also often featured music from some of Margera's favorite bands, such as HIM, CKY, The Bloodhound Gang, Cradle of Filth, Clutch, Turbonegro, Dimmu Borgir, Carnal Forge, Slayer, Gwar, Children of Bodom, The Bled, The 69 Eyes, and skate rock legends Free Beer. Many of Margera's friends also appear on the show, including Johnny Knoxville, The Dudesons, and fellow skateboarders Tony Hawk and Bob Burnquist. Actor Sean Penn and his son Hopper also made an appearance in one episode. Rocker Billy Idol appeared on a very special birthday episode.